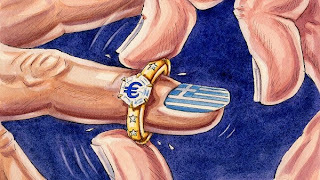 The relationship between the government of Greece and the rest of the eurozone increasingly resembles a bad marriage. The two sides are sick of the sight of each other. Mutual trust has broken down. Efforts to patch things up continue, but nothing seems to work. The conventional solution to such a dilemma in a real marriage is well known: divorce. Divorce settlements usually mean that both sides suffer financially. The two parties go ahead anyway, because they are prepared to pay a heavy price to get out of a bad relationship. We have now reached that moment with Greece and the eurozone. The relationship is broken. It is time for both sides to make a fresh start. Those who fear the consequences of a Greek exit from the euro — a Grexit — would point out that the marriage metaphor could be dangerously misleading. There are well-established processes for breaking up a union between two people. There are far fewer precedents for breaking up a currency union. The risks involved have been ably set out in a recent column by my colleague Gillian Tett, who highlights the danger that Grexit could lead to a global financial meltdown, similar to the one triggered by the 2008 collapse of Lehman Brothers, because of the unquantifiable legal and financial risks involved. However, German negotiators and some elements of the Greek government give the impression they think that the risks of Grexit are containable. If they believe that, they should take a deep breath and go for it. At this stage, it could be better for both sides.